Hey everybody, Truffles here! As you can see, I'm checking out the paperwork on a new product that I was asked to review. Mommy recently ran across a Facebook post from Pet Naturals of Vermont announcing a Blogger Influencer Campaign for their Calming products. She signed me up immediately because she says I need them...badly. Here's the story: I have been scared to death of my grandpa (Mommy's dad) for weeks. Everything was fine between us until a couple months ago when he stepped on me. Don't freak out...it wasn't on purpose. Mommy actually says it was partly my fault because he was stepping over me, I jumped up at the same time, and we collided. He didn't hurt me at all, but I just couldn't get over it. He would walk on eggshells around me because I would run from him the minute I saw him; even his feeding me my favorite treats hadn't helped to rebuild the trust between us. It got bad enough that on the weekends when he's around more often I just hide out in Mommy's bedroom. We were about to seek counseling from a kitty psychiatrist. Needless to say, Mommy looked at the offer of these treats as divine intervention...treats are my favorite things in the world, so treats that might help calm me down in stressful situations were just icing on the cake! We've been using them for several days now; Mommy gives me a treat whenever her dad is going to be around, and the transformation has just been remarkable! I've let him pet me, I wash up right next to his chair (while he's sitting in it! ), I nap in my lounger while he's in the same room...Mommy just can't get over how these treats have helped me to deal with my fear. Guess what? Your kitties can try them too! And what a perfect time of year with the stressful holidays upon us and all kinds of strange relatives invading our homes! 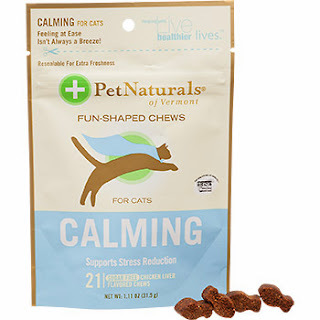 Just go to http://www.petnaturals.com/calming-offer/...the first 200 people to sign up will receive a free 21 count Pet Naturals Calming for Cats. After the first 200, a downloadable coupon will be available for up to $2 in savings. Disclosure-I was sent a free package of treats in return for my honest review of this product. All opinions expressed here are mine and Truffles'. Calming for Cats is an all-natural supplement that helps alleviate stress related behavior problems without effecting your cat’s personality or energy level. It can be used daily, or when extra help to relax as needed (especially around the holidays!). It comes in a tasty bite-sized format, so your cat thinks he has just receiving a mouth-watering liver reward. Calming for Cats, however, is much more. Colostrum Calming Complex is isolated from milk protein and is known for its calming effects and it works synergistically with L-Theanine, also included in the formula. Theanine is an amino acid that supports calming and relaxation, reduces irritability and low mood states. L-Theanine naturally occurs in green tea. Studies have shown that it helps your cat’s body produce other calming amino acids such as Dopamine, GABA and Tryptophan, bringing certain neurotransmitters into better balance and calming cats without adverse effects or drowsiness. B Vitamins help manage stress and help maintain normal disposition. Thiamine (Vitamin B1) has been shown to affect the central nervous system to help calm and relax animals. Stress can deplete this very important vitamin. Lecithin is rich in Choline and Inositol, which help to support brain function and manage stress. 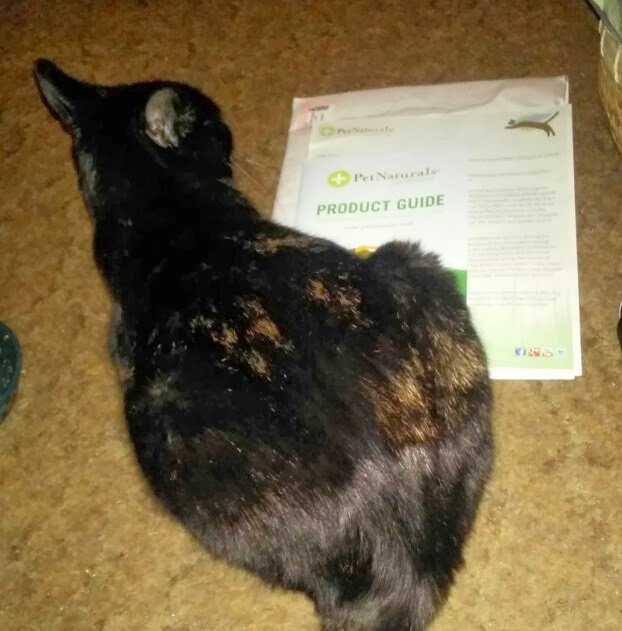 Calming for Cats does not contain any unproven or potentially unsafe herbal ingredients that may cause side effects such as addiction or drowsiness. Thanks for the heads up on this calming product for cats. My tortie kitten was semi-feral when I adopted her and she's hyper-vigilant at times, especially when she sees shadows or hears strange noises. My older rescue cat (18+ years) is blind in one eye and has gotten quite irritable when he's disturbed, usually when I try to move him off my pillow. I'm hoping this product will mellow both of them out. Thanks again. We loves Pet Naturals! The Mom did a product review last year or so... the mom furgot when... and they are like the bestest! We like the Pet Natural Vitamins too! The Mom actually found these at our grocery store and then found out about the product review! Glad they am helping. don't know if we can do another purrview but we haves noo kitties who haven't tried these. purrz, Toby and Sammy Purrzalot. I just requested mine. I'm very interested to see if these will help my babies in stressful situations. I'm so glad they are working out for Truffles! We had those here, too! We were trying them out when I was being introduced to the new kitties. I got one every day!! Don't feel bad about the step on. Love your grandpa again. He loves you. - Crepes. Those sounds pretty great! We just signed up, too. Thanks! Mowzers! We are amazed at how well these work! Impressive! We needz to apologize to you for not keeping up wif yoru bloggie. It wasn't til we saw a link on FB that we thought "wait, feedly hasn't been updating us on her posts...!" oops. OUR fault totally. What a neat idea! Glad you're enjoying them Truffles and thanks for sharing. Oooh! We almost missed this post and offer! Thanks! We just signed up.